Family reunions can be one of the most anticipated events of the year, or they can be a total nightmare — depending on which family member you talk to. Perhaps you’re looking forward to reminiscing with that cousin you never got to talk to, or hearing old war stories from your great grandfather, or maybe you’re trying to avoid that one aunt who insists on styling your hair with her spit. Either way, family reunions can be a lot of fun, but they can also be expensive. Housing, feeding, and entertaining that many people from various parts of the country can be quite a costly feat. 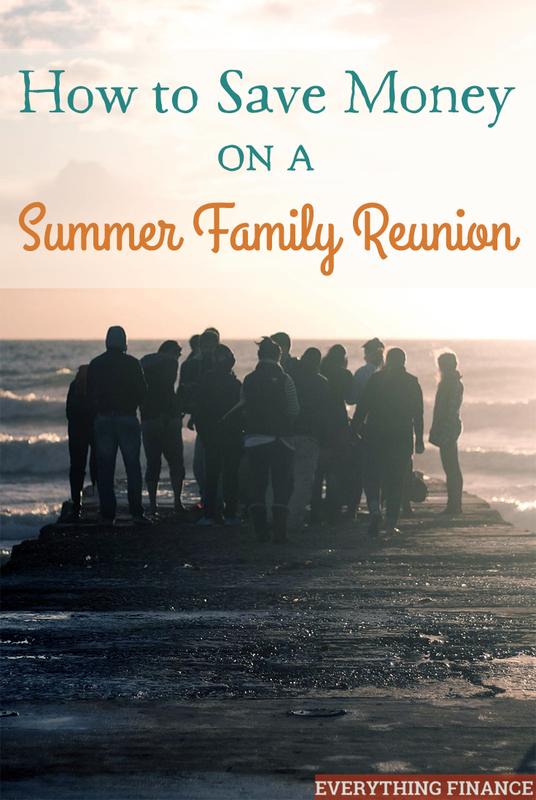 Here are some ideas on how to save money on your summer family reunion. The biggest way to save money on family reunions is to find a way to get free housing. However, very few people own homes that can house large groups of people. While ideally it would be great if a family member could host the family reunion, it isn’t a very likely solution for most. Renting a large beach house will be a more cost-effective option than having individual families book separate hotel rooms. By pooling your money together, you can easily cut housing costs and book a house large enough for the whole family. Beach destinations are great, as are the mountains. If you’re willing to get even more adventurous, you could make it a camping trip and stay at a state park. These are good choices to consider if you don’t want to be confined to a house with your family for a weekend. Plus, they create more memorable moments! Not only can going out to eat be an incredibly expensive option for a family reunion, it can also be quite impossible to find a restaurant that will take on such a large group. Assign families to certain meals to split the costs. Family A can do breakfast the first day, lunch the second, dinner the third, snacks and dessert on the fourth, and so on. Splitting up the meal obligations not only cuts down on food costs, but helps split the duties evenly. If you’re renting a house, go grocery shopping at a local store and cook up family favorites. There are so many ways to entertain families for free. Choose free entertainment before any paid source. Games of charades, Bingo, Pictionary, cards, Scrabble, and other board games can easily be played indoors. Outdoor games such as bobbing for apples, bocce ball, sack races, limbo, horseshoes, badminton, and obstacle courses can take place during the day outside. These games often create hilarious picture-perfect moments and help bring families closer together—which is the whole point of family reunions anyway. If all else fails, ask for a group rate. Often large parties can save money by booking in groups because vendors are guaranteed sales. If there’s some activity or place you’re dying to take advantage of, make sure to always ask if there’s a group rate option available. Family reunions are great to bring together family members from all over the country. But cost should never be a reason to keep family members apart. How have you saved money on a summer family reunion in the past? What activities do you like to enjoy with your family? Whenever we have a family reunion, we always practice potlucking. This is I think one of the effective ways to save money and distribute expenses in every group.